A few weeks ago we went to Florida with some friends. On our last day we had run out of regular bread, so had to eat some of my friend’s Gluten Free bread. I now feel the pain of Gluten Free bread. It is a tragic thing. Oh yes. I figured that surely not all Gluten Free baking can taste as bad as the terrible bread we ate in Florida. 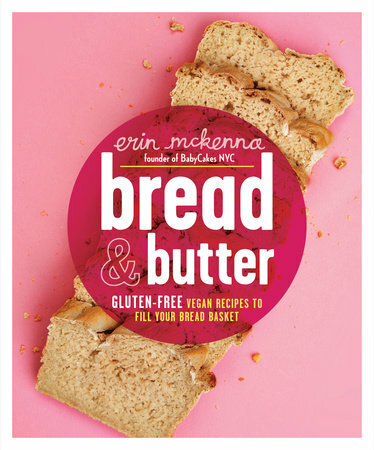 The author is Erin McKenna, founder of BabyCakes NYC, and self-confessed possessor of a sweet tooth. However, this is her book dedicated to the more savoury things in life. The recipes cover a wide range of breads, including making pizza and focaccia, but also puff pastry and crackers. The main area of the book is the bread though, so I wanted to give it a go and see for myself whether Gluten Free bread could ever be tasty! Overall the book is cute, and well put together, with plenty of pictures of almost all of the end results of the recipes, and also including a lot of information about all the different flours and ingredients required in Gluten Free baking, so imparting a lot of the knowledge acquired by the author over the years she has been baking Gluten Free. If you ever decide to make anything Gluten Free, I feel you just have to accept that you need to just empty your pockets of cash to purchase pretty much everything ever made by Bob’s Red Mill. I already had a reasonably well stocked cupboard of random ingredients, but to make the sandwich bread, I had to buy potato starch, oat flour, millet flour, and arrowroot (having already got coconut oil, xanthan gum, yeast, and agave nectar). Make no mistake, this is an expensive loaf of bread. Haha! Pictured above is my first attempt. I think it was overproved and underbaked. After just about 30 minutes of proving, it had already exploded out of the top of the pan and into the shower cap I use to cover things while proving, so giving rise to that beautiful (!) texture on top…. Oooops. Underbaking I could and should have predicted would happen by past experiences with my poor oven, and added some extra time, so the insides I think could have done with a little longer. Tastewise? It actually tastes pretty good! I was quite surprised. The taste is not dissimilar to the usual bread I make, although the texture is a little different. Would I make it again? Maybe. Especially now I have a cupboard full of random ingredients. Not having to knead it means that it comes together really easily, although next time I would obviously watch it like a hawk during proving to ensure it didn’t go too crazy! I now am prepared for next time my Gluten Free friend comes to visit. I hope by “gluten free friend” you mean me! Because I plan to come back at some point! And then you can feed me all the yummy experiments! It looks better than the one time I tried to make it. And yeah…gluten free cooking is ridiculously expensive.